1. Which social media platform do you think has made the biggest contribution to your success? I would probably say Instagram has (if you aren't following along, you definitely should!). Personally, Instagram is my favorite form of social media because I love snapping pictures throughout my day and editing them to my liking. Not only does it show your readers a sneak peek into your life, but it is also a great marketing tool as well! 2. 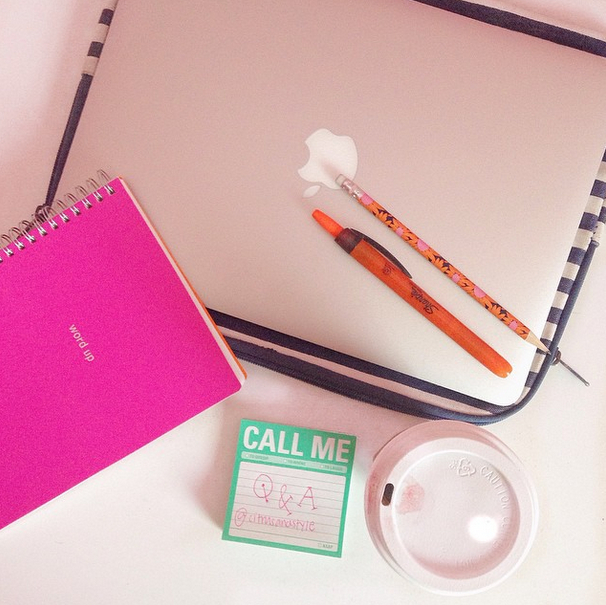 How do you balance consistently blogging and keeping up with school and sports? This is definitely a tough balance to maintain! Now that tennis is over, I usually don't have too much extracurriculars after school so it's easier to write posts on week nights. However, when I do have sports, clubs, etc. after school, I plan ahead on the weekend and write most or all of my posts then. Throughout the week, I will often get inspiration for posts so I keep track of those in a notebook or on my phone and this makes it a lot easier to write them come the weekend. 3. Tips for success in your sophomore year of high school? Sophomore year is all about finding your niche and forming study habits that will transition into your junior and senior years. Really enjoy your sophomore year because, like you've probably heard, junior year is a pretty rough one. I recommend really getting involved at school and find a few different areas that you love (ie. yearbook, a service club, tutoring, etc.) and this will help you meet more people who share the same interests as you! Also, if you haven't already, it's crucial to figure out how you study best and what methods work for you. 4. What is the best way to attract readers? I get this question a lot and I honestly think being genuine and real is the best way to get more readers. When I'm writing posts, I pretend I'm talking to you guys face to face rather than typing because I think it's really important to let your real personality be seen! Besides that, being consistent with your posts and having an easy, lighthearted site definitely contributes as well. 5. Why did you decide to start a blog? To be honest, it was really a spur of the moment decision! I had heard of blogging before, but didn't really know what I was getting into. I wrote a post or two and gave up (this was way back in 8th grade, oyy) and then started up again freshman year. A few different people told me they thought I would enjoy it, and it turns out they were right! Blogging has been so rewarding for me and has helped me discover that I love working with brands, styling products and collaborating with others, great things to know when I try to decide which major to go into in college! 6. What do you love about tennis and when did you start playing? I started playing tennis when I was about 4 since my uncle is super into it and has been teaching for years. I've always grown up playing it (for fun, taking lessons, playing tournaments, etc.) so it has been been a really enjoyable thing for me. Naturally, I decided to play in high school and have learned to love it even more because of my amazing teammates and coaches. One of the main things I love about it is that tennis is a lifelong sport, so you can simply pick up a racquet and play. Unlike other sports, it also comes pretty naturally to me since I have been playing for so long. 7. How do you maintain a wardrobe on a high school budget? Oh gosh, this is a tough one! After having worked a lot this summer, I decided to put a huge chunk of my money into my savings account and save a little bit for spending money. Unlike a lot of other bloggers, I really try to buy only the clothes I need, and rarely make huge impulse purchases (the last one was a pair of Kate Spade gingham jeans on mega sale last spring). It definitely helps having a school uniform because I don't need to have casual clothes to wear during the week, but my biggest tip is to be smart about sales. Subscribe to your favorite brands' email lists and jump on big sales when you need to stock up on jeans or sweaters. Also, if you find something you love at a pricer store (ie. J.Crew), check out Target, Old Navy and Gap because they often have similar styles for a lot less expensive! 8. How do you stay dedicated to school? Any helpful tips to force yourself to go above and beyond? This year especially, staying motivated is really difficult. With sports, extracurriculars, friends, etc, there's so much to all maintain. When I don't want to study a little more for a test or spend a bit longer on a paper, I think of what colleges I want to apply to and what GPAs I need to get into those schools. Often times, this really motivates me to try harder so I won't look back sometime in the future and think "if I would have studied a little more, would I have gotten into this school?". In general, I've always been a pretty hard worker but keeping your goals in mind always helps go a little bit more above and beyond on homework assignments and assessments! 9. What is your favorite brand of casual, cute and comfy clothes? Ah I love so many! I guess people have different opinions on what is considered casual and comfy, but I would have to say Gap is my favorite. Their sweaters are to-die-for in the cozy category and I practically live in their white shirts button downs for school. Not to mention, if you catch a 40% off sale, you can get a lot of their pieces for great deals. 10. Any study tips/ how do you stay organized for school? I have a few different posts I wrote in the past about these topics! Here is one for studying/ exam essentials, another for taking organized notes, and one for my school supplies. Hope these help! This was such a fun post for me to write and I hope you thought it was helpful! Would you like to see more Q&As in the future? What a great post! You have some awesome school advice. Loved getting to know more about Citrus & Style through this Q&A. Loved reading these and getting to know more about you! I agree with Instagram - thats my favorite platform too!